I’m intrigued by the name of your website, Moontoe Gallery. Where did “Moontoe” come from? When I was two, we lived in New Orleans and they were re-paving the street out in front of our house with asphalt. My mom and I were standing at the curb watching when the big steam roller came by and flipped a up popcycle stick that had a little piece of hot tar on it. It landed on my right foot just above where the big toe connects. It burned a perfectly round scar that looks like a moon.As I grew older I imagined that it was the sign that the King’s scouts were looking for to find the long lost fairy tale princess. 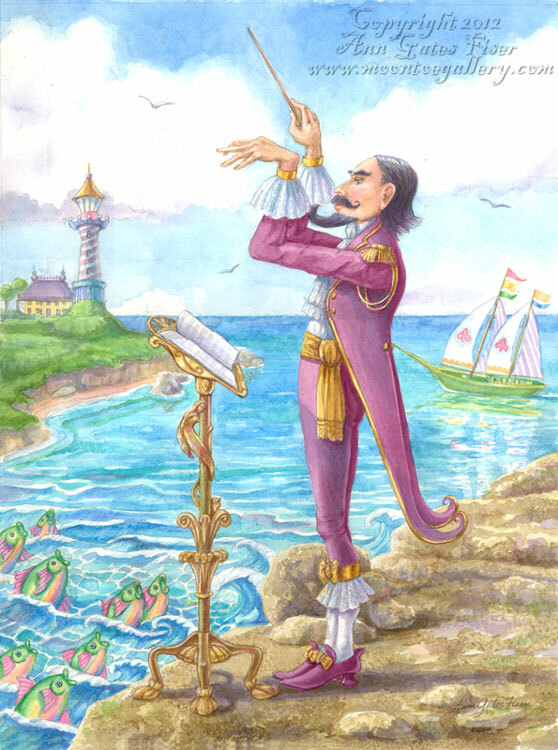 When trying to figure out a unique name for my website I remembered this childhood myth and decided that it was perfect for my gallery name.It was whimsical and it was me, literally. For fantasy art I work mainly in watercolor, although that’s changing. Lately I’ve fallen in love with graphite. It’s been a big surprise to me, because I love color so much. But I’m enjoying the challenges that pencil presents such as having to be very precise with values for things to read correctly.I love the fluidity of line work. I also use colored pencil occasionally and ink. 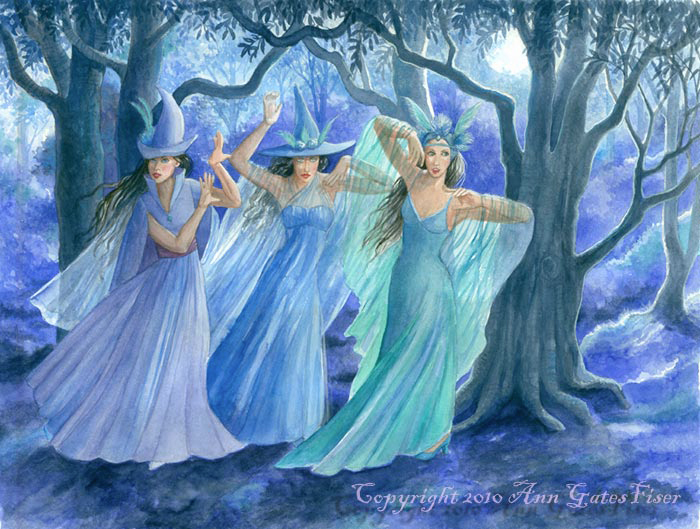 When I paint murals I use acrylic and latex and have been thinking about trying acrylic with my fantasy painting. Many of your sketches and paintings seem to tell a story or stories. Do the stories come first or does the art create the story? The process works like this for me. I usually have an image or an idea that pops into my head in meditation or just before sleeping or during waking.As soon as I can, I sketch it out. As I’m sketching the story starts to come and helps add detail. I believe that both story and image are present in my unconscious at the time when the image forms. It’s for me to discover what the story is. 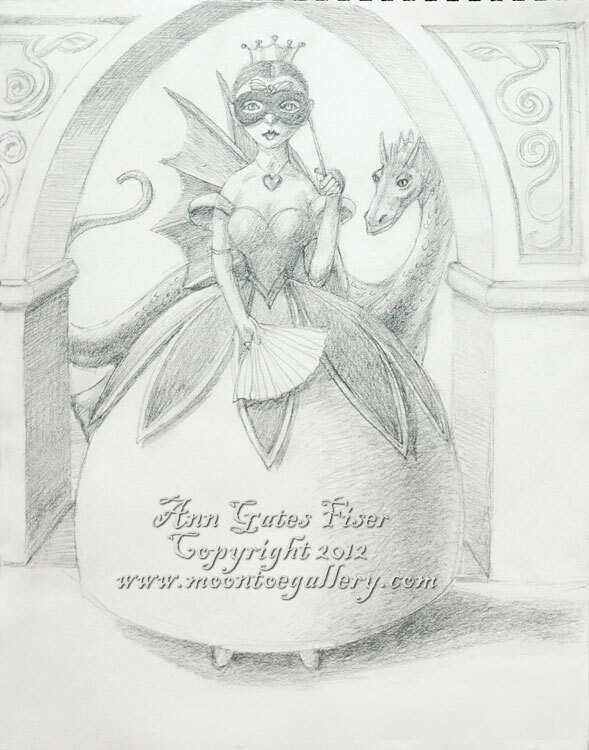 Your children’s art includes a dragon series, which I love. Why dragons? Of all your questions this one was the hardest because I started painting dragons about 30 years ago. So I had to dust off some big cobweb’s to get an answer.Two memories came to mind. The first was an exhibit that my mom, my husband , and I were asked to give at University of Texas, Arlington sponsored by the Sesame Street Theme Park that had just opened. The only caveat was that we had to base our paintings on the park’s attractions or rides. One of them was tone of those pools filled with colored plastic balls. 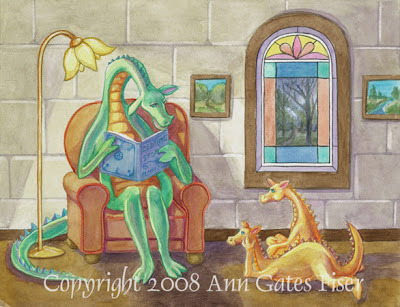 I chose that for one of my paintings and imagined a dragon taking a bubble bath in a river of rainbow colored bubbles. The second dragon I painted was an illustration for a book that a friend had written about a rainbow colored dragon. In doing both projects there was just something that appealed to me about painting dragons very whimsically and making them friendly instead of fierce. Your painting goes beyond paper and canvas to creating and then painting furniture, knobs, lamps and fairy boxes. What a beautiful idea. You are multi talented. How did you get the idea to do all these marvelously creative things? I really don’t know for sure where the idea to paint furniture like I do came from but after I did then I had to paint on lamps and knobs because I didn’t like the way that ordinary lamps and knobs looked with my furniture. I think painting household items like this is just an extension of my fantasy world. After all you wouldn’t expect a fairy princess to have furniture from Crate and Barrel, would you? What inspires you in your sketching and painting? I look at the work of other fantasy artist all the time and I’m so grateful to have the Internet which makes it possible to have seen more fantasy artwork in the last ten years than I’d seen in the rest of my life. I look at other’s art and at the back of my mind is what do I like about this and why? I think that it helps me clarify who I am as an artist. However these days I think that what’s happening now is that I’ve completely removed the censorship of my imagination. I’m no longer controlling what comes up. If an idea or image presents itself I don’t judge it or alter it to make it more acceptable or in line with what’s being done by others. For the first time I feel like I’m genuinely being myself as an artist. And I’m loving it! I’m a musician and a songwriter. I play piano, guitar, mandolin, harmonica, and kazoo . I love acoustic/contemporary folk music. I used to make my living singing in bars, restaurants and hotels and occasionally still perform locally. I also love to garden and I’m a gamer with my current infatuation being Everquest 2, a multi-player online fantasy role playing game. 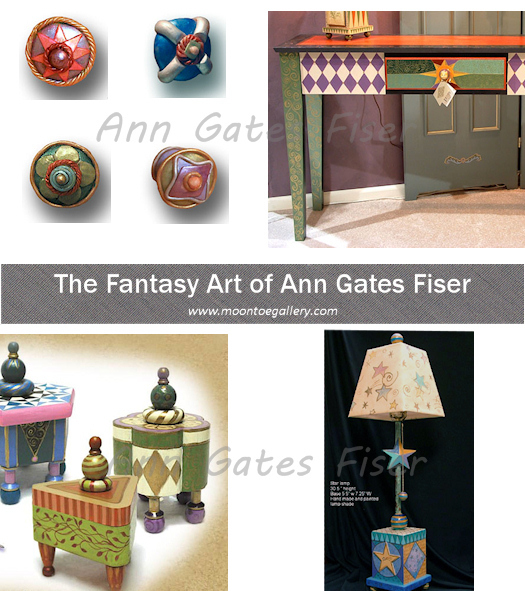 Want to see more of Ann’s beautiful art and painted furniture? Drop by every Friday to meet more fabulous artists. 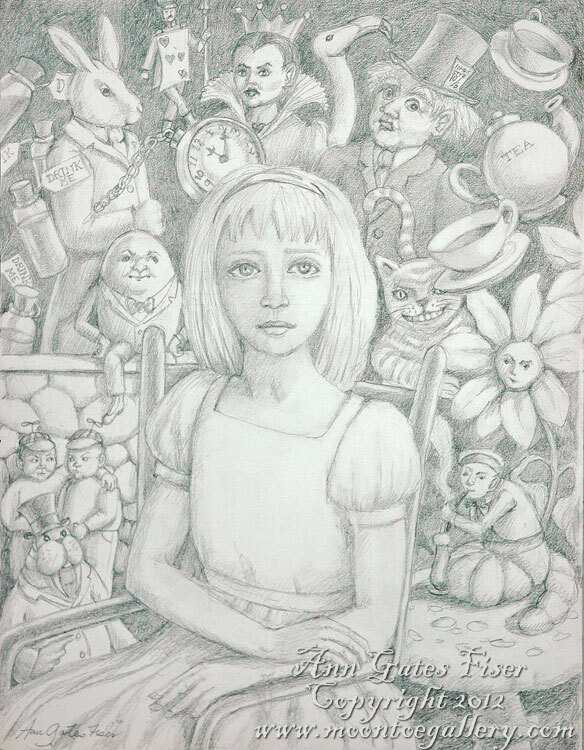 Next week, I’ll be featuring artist, Deanna Bach-Talsma. 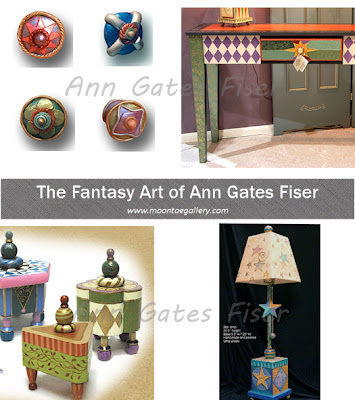 Posted in artist feature and tagged Ann Gates Fiser, artist, artwork, fairy box, fantasy, furniture, lamps.